Amp up your dinner routine with more than 100 restaurant copycat dishes made at home! 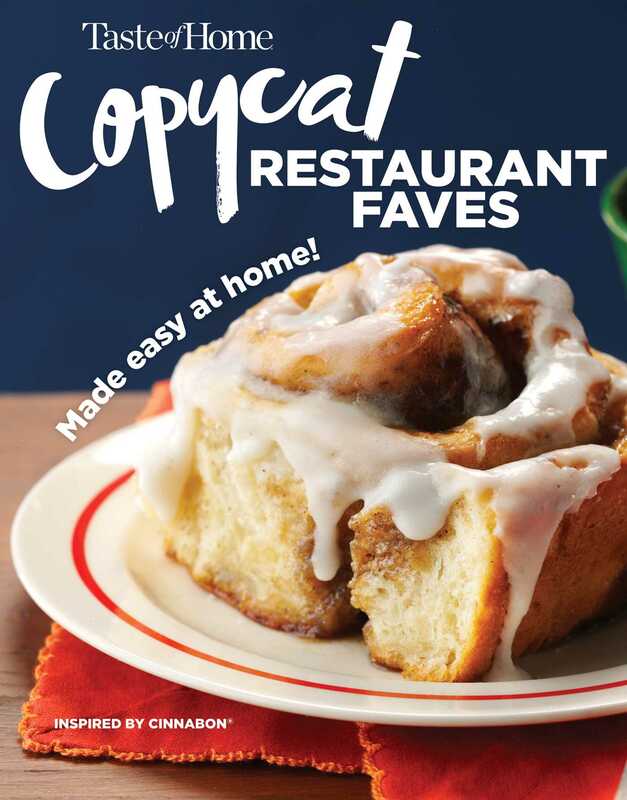 Skip the delivery, avoid the drive thru and keep that tip money in your wallet, because Taste of Home Copycat Restaurant Faves brings America’s most popular menu items to your kitchen. Inside Taste of Home Copycat Restaurant Faves you’ll find more than 100 no-fuss recipes inspired by Olive Garden, Panera Bread, Pizza Hut, Cinnabon, Chipotle, Applebee’s, Taco Bell, TGI Fridays, The Cheesecake Factory and so many others. Dig in to all of the hearty, savory (and sweet) menu classics you crave most—all from the comfort of your own home. With Taste of Home Copycat Restaurant Faves, get all of the takeout flavors you love without leaving the house!